Sharpens Fabric, Industrial and Household Scissors and Shears Quickly and Easily. Comes with Training Video and Manual. Sharpens 20 - 30 pairs of scissors per hour, no need to disassemble. PERFECT for Professional & Mobile Sharpeners! Sharpens scissors and shears up to 14" without re-clamping. Clamping System Adjusts from 0 to 55 Degrees. Powerful 1/4 HP Motor can be Wired for 220 Volt Use. Sharpens pinking shears and curved blades. Honing Wheel Makes Scissors 2 to 6 Times Sharper Than New! Free copy of Sharpening Made Easy with each purchase. We supply the PRO-TAS with the optional ERGO handle clamp at no extra charge. If you want to sharpen industrial and household scissors I recommend the PRO-TAS. The PRO model can be upgraded to sharpen rotary blades. 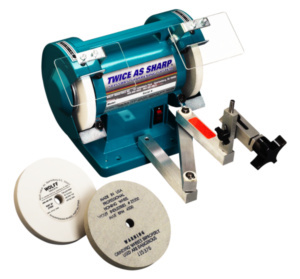 My Sharpening School in a Box includes a $50 discount on the Twice As Sharp. Many pros use the TAS for industrial and household scissors and use a flat hone like the one below for salon shears. Everyone who has purchased the Hira-To flat hone is raving about it! The new patented ball bearing convexing fixture designed by Roger Kaye of Rapid Edge fame makes convexing quick-and-easy. It is the closest thing to free-hand sharpening but with an element of control that free-handing just cannot match. Made in the USA by Wolff Industries, Inc. The multi-speed motor runs from 100-2500 rpm. The weight is only 15 lbs. List Price $3082.75 Our price after discount $2,775.00, shipping included. 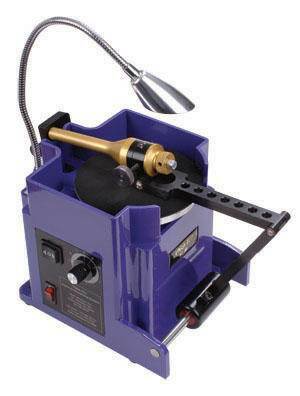 Bonus: Purchase a Hira-to and receive Sharpening School in a Box free of charge. I also also recommend training at the Wolff factory in Spartanburg, SC.